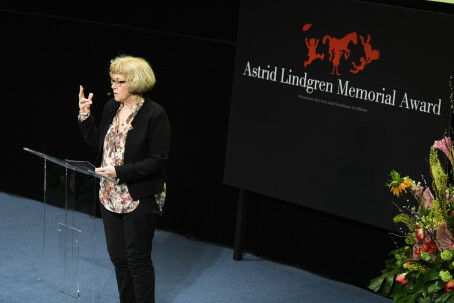 The candidates for the Astrid Lindgren Memorial Award 2019 will be presented on October 11th at the Frankfurt Book Fair. The award amounts to SEK 5 million (approx. EUR 570 000), making it the world’s largest award for children’s and young adult literature. So far, eighteen laureates have received the award. The current laureate is the American author Jacqueline Woodson, with her successor due to be announced 2 April. According to the tradition, the ALMA jury chair Boel Westin will present the nomination list at the Frankfurt Book Fair. The nominees are authors, illustrators, oral storytellers and promoters of reading who have been suggested by more than 100 nomination bodies from around the world with in-depth knowledge about children’s and young adult literature. Welcome to join us on Thursday October 11th at 5 pm at the Frankfurt Kids Stage, Foyer 5.1 / 6.1. The nomination list of 2019 will be available on http://www.alma.se/en shortly after the programme. The 2019 ALMA laureate will be announced on April 2nd.